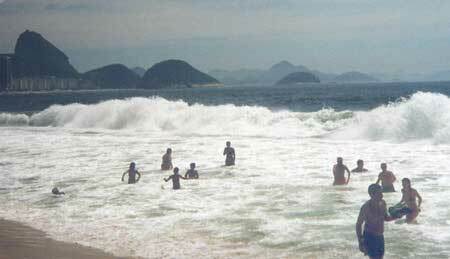 Ipanema Beach is one of the world's great beaches. Here the famous song "The Girl from Ipanema" was brought to life. This anthem of unrequited love and a catchy Bossa Nova beat set the world on fire in the 1960's, and jazz would never be the same again. 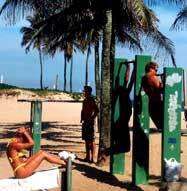 Here (and in nearby Copacabana Beach) is where the beautiful people come to see and be seen. 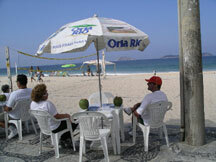 Ipanema caters to a richer and more chic crowd and is considered safer. (As in less theft.) It's my kind of place. The beach life is "The Life" for most of the regulars. Exercise, sports, strolling and swimming are all important activities. Friends and family meet in a specific spot of the beach - the same spot - day after day, all summer long, for years. There's no other place for most people in Rio to go. It's so crowded. The beach is truly Rio's backyard party. Just look at the backdrop to the scene below. The surf is waiting for you to jump right in. Coconut milk in real coconuts cools off most spectators. This Carioca (what Rio women call themselves) is looking good as she waits by herself. Probably not for too long. Exercise makes the body grow tighter. It's an important activity for a lot of the beach goers. 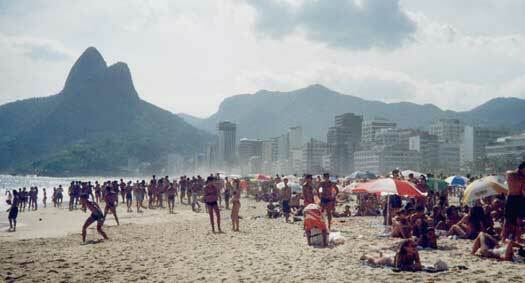 The Ipanema Beach itself appears chic, along with the "In" crowd. It sports a double Sugar Loaf like mountain to the southwest. The girl watching is world class.